Meet Your Neighbor Susan Bray who is currently employed at La Harpe Elementary as a Title 1 teacher. Susan was a New Year's baby, born to Wendell and Eleanor Link in La Harpe Hospital on January 1, 1964. She grew up in rural Durham and La Harpe. Susan graduated from La Harpe High School in 1982. She attended Culver Stockton College enrolled in the secretarial program. 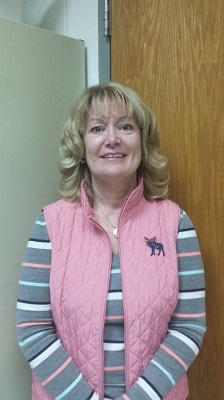 She has two degrees from WIU, a B. S. and a M. S.
Prior to her current job at La Harpe Elementary Susan worked for 14 years at Nauvoo - Colusa Elementary, at La Harpe School part-time, and as a secretary at WIU. Susan's parents, Wendell and Eleanor Link are retired farmers who now live in La Harpe. She has a brother, Bradley Link. Bradley and his wife Sheila have four children Amy, Amanda, Teri and Christopher. Bradley is a farmer and lives in La Harpe. Susan's sister is Barbara (Alan) Mehaffy. She is a dental hygienist for Dr. Rodeffer. Barbara and her husband have three children Brian, Mitchell and Hayley. They live in Burlington, IA. Susan's grandparents were Lewis and Eva Link of La Harpe and Floyd and Alma Klossing of Dallas City. Susan married Wayne Bray on January 6, 1990. Wayne is a farmer. They live outside of La Harpe. Susan and Wayne have three children, Randy, Kevin and Paige. Randy and his wife Kelsi have a son Weston. Randy works at Bower in Macomb. The family lives in Fandon. Kevin is a WIU graduate. He is employed by Millard Company in Burlington, IA. Paige is a biology major at Culver Stockton College. She is a junior who plans to become a forensic scientist. Susan loves to travel. A favorite vacation was a trip to Alaska for her 25th wedding anniversary. Another favorite vacation spot is the Biltmore Estate in North Carolina. Susan has visited there three times. Susan's future plans include continuing to work at La Harpe Elementary, to travel (maybe to Biltmore Estates again) and to enjoy her children and grandchildren.